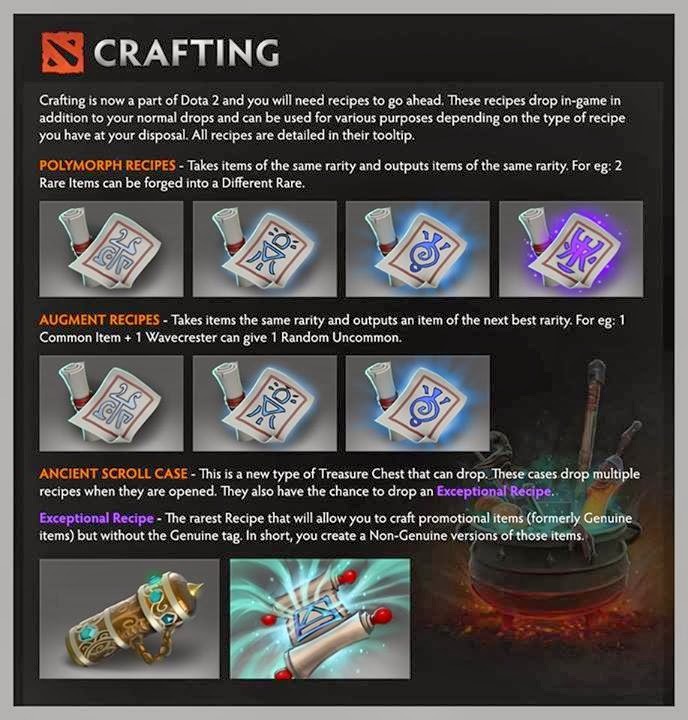 Crafting is a feature that allows players to create new cosmetic items by combining other cosmetic items. Crafting requires Recipes, consumable tools that indicate the items needed to craft the new item. · Chance from opening the Ancient Scroll Case and Treasure of Heroic Bounty. · Chance as a drop after playing matches. · Players can receive both a cosmetic item and a recipe in one game. · Playing the Diretide 2013 game mode. · Through trade or purchase on the Steam Market. To craft, right click on the Recipe in the Armory menu. 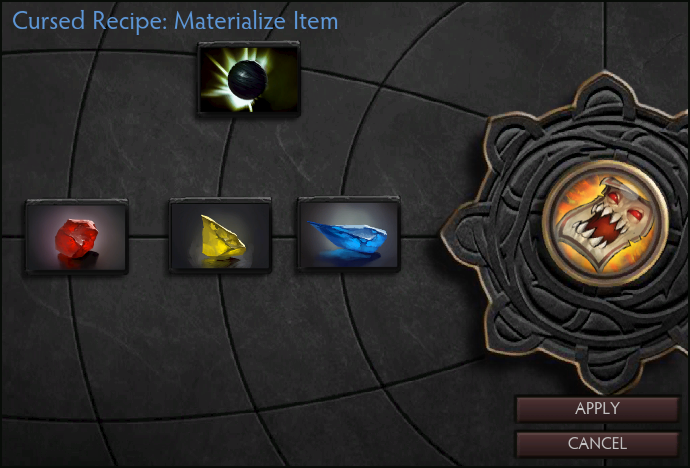 The materials needed are outlined in the Recipe's tooltip. Fill in the slots with the requested items and you are ready to craft. Recipes can be found by playing games, opening chests and taking part in holiday events. They can also be sold and purchased through the Steam Community Market and traded with other players. Below are examples of some of the recipes you can find. Always read the tooltip of a recipe before trading or purchasing as some recipes have varying inputs. Outputs are based on which type of recipe you use, for example an Augment recipe has an Uncommon, Common and Rare version. Polymorph recipes require several random items of a certain rarity. Once crafted they output a random item of the same rarity. 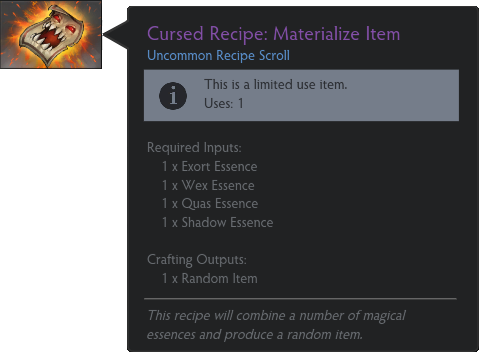 Augment recipes require random items of a certain rarity and specific items. Once crafted they will output a random item of the next highest rarity. Exceptional Item recipes require a lot of items to craft. Once crafted they will output a specific exceptionally rare item. The output will depend on the recipe. Artificer's Brand recipes require a lot of items of different rarities to craft. Once crafted they will output an Artificer's Brand, which is used to upgrade a courier to Unusual quality. Unusual Artificer's Hammer recipes will require several random rare items along with a standard Artificer's Hammer. Once crafted they will output an Unusual Artificer's Hammer. Artifcer's Hammer recipes will require several random common items and a specific item. Once crafted they will output an Artificer's Hammer. Artificer's Chisel recipes require several common or uncommon items. Once crafted they will output aArtificer's Chisel. The recipe tooltip will provide you with what you need to input it and what will be the output. 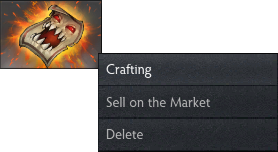 Crafting can be done by right clicking on the recipe thumbnail and choosing "crafting". The crafting screen will show you a list of empty slots for you to place your items into. Use the backpack viewer beneath this screen to fill them in. When you're done filling in each field select Apply to craft the recipe. 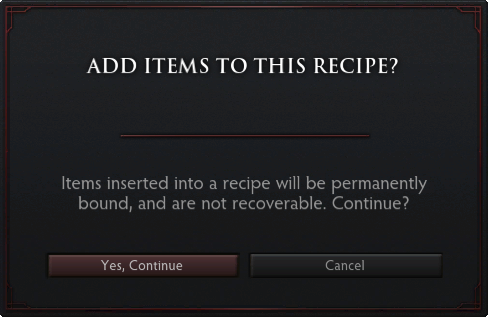 If you've partially completed the recipe you can bind the items into the recipe for use in the future. Saving items into a recipe will consume them, and they cannot be extracted. These recipes combine items to create regular Quality versions of Genuine items.